Listen, I appreciate that you want to monetize your web site. I appreciate that advertising is the economic engine that drives the web, and that without it I’d have far fewer high quality sites to peruse, and all the good ones would probably have subscription fees. 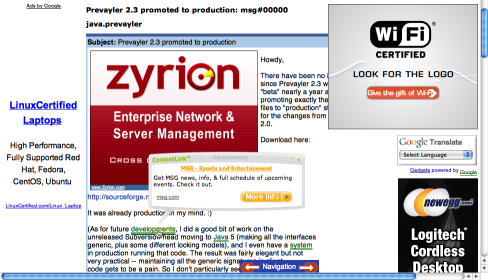 So, I’m actually quite comfortable with ads being on your site. But seriously? There is a limit to what I will accept, and if you continue to exceed it one of two things will happen: either I will stop coming to your site, or worse (for you) I will continue to consume your sites resources (bandwidth and CPU) but use an ad blocker to prevent my from ever seeing your $@$#% ads. In case you, as a web site owner, are unsure as to where this limit is, here is an example of a site well past it, but, unfortunately, not unusual. Please, take a hint from Google.com folks. They’ve figured out how to put a whole pile of ads on the page without making it difficult to read the page you actually came there for.